It wasn’t so extraordinary in 1915 for fourteen-year old girls to play leading lady opposite silent comedians. It was extraordinary that one of those adolescents, already a veteran of stage and screen when she signed on to play "the girl" in Harold Lloyd’s "Lonesome Luke" one-reelers, would go on to enjoy a career that lasted into the sixties, one which would successfully embrace virtually all twentieth-century media. 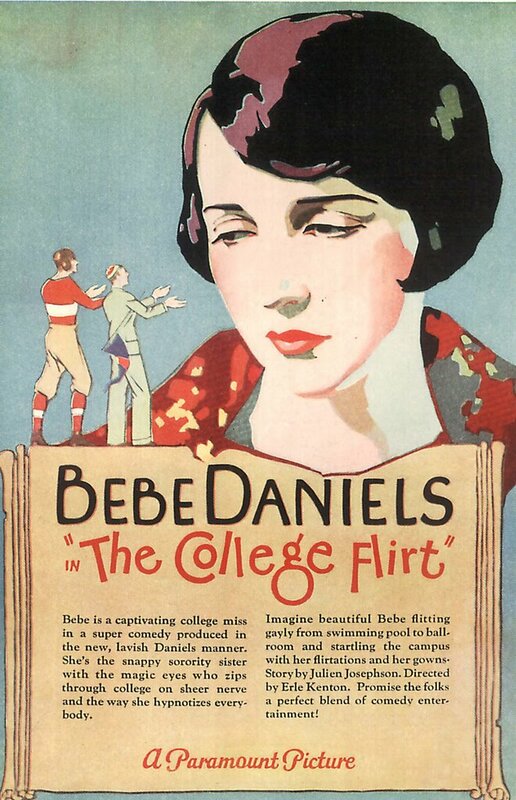 Why someone hasn’t written a major biography of Bebe Daniels is an ongoing paradox to me. I should think that at the very least, some woman’s studies professor would get hep to the fact that here was a feminine dynamo who masterminded a series of amazing careers --- each of them enormously profitable --- and none of them possible had it not been for Bebe’s creative guiding hand. If the movies had a Renaissance woman, she was it. One of the big reasons we don’t know her better is the fact that she and husband Ben Lyon took the show across the pond in the mid-thirties, and the phenomenal popularity she garnered over there was all but unknown stateside. By the time she died in 1971, we’d forgotten all about Bebe Daniels. Indeed, she was little more than an obscure name who’d once shared the bill with Rudolph Valentino and Harold Lloyd (that’s her with Rudy in 1924’s Monsieur Beaucaire). We were just too provincial to realize how much territory her stardom took in. To this day, we still don’t get it. 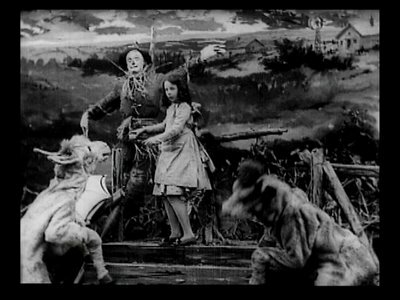 That neat set of DVD’s called More Treasures From The American Film Archives contains a hitherto lost subject from 1910 called The Wonderful Wizard Of Oz. They say it’s the first screen adaptation of the L. Frank Baum stories, and the nine-year old kid playing Dorothy is Bebe Daniels. That’s her with the Scarecrow and others in the fuzzy shot, and get this, she’d already trod the boards five years when she made it. Convent school was a drag because the other girls with their dollies were unfamiliar with Shakespearean passages, which Bebe could by now quote. Precocious was hardly an adequate word to describe the nubile teen who stormed the Hal Roach lot and defied the studio’s preference for a blonde ingenue to act as foil for a twenty-two year old Harold Lloyd. Brunette Bebe got the job through sheer force of personality and made a staggering 144 short comedies with the comedian before decamping in 1919 to go work for Cecil B. DeMille. In the meantime, she and Harold had a thing going which might have led to the alter were it not for her ambition and his ambivalence. Career minded Harold met his match in Bebe. He liked his women passive. She was anything but. Chances are he loved her, because he wore a ring she’d given him until the day he died (Harold and Bebe passed within eight days of the other in ’71). 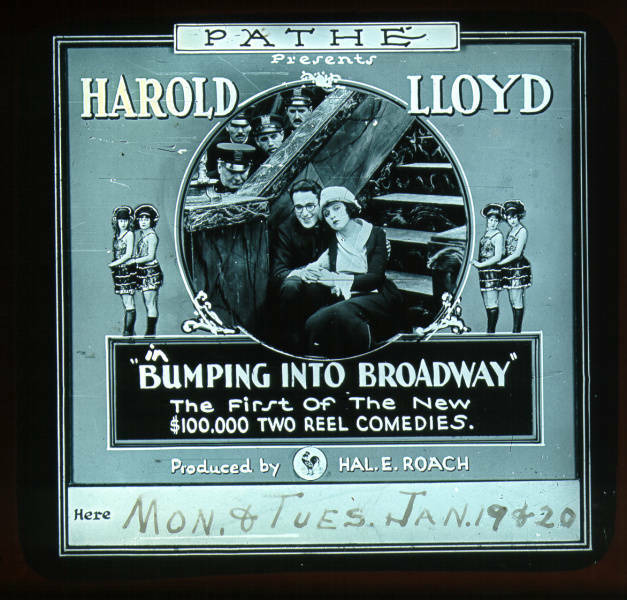 DeMille and Jesse Lasky had noted her popularity with Harold and tried to poach her away from Roach, a major breach of protocol in those days. When her contract was finally up, Bebe headed over to Paramount and $1000 a week, up from the $100 she was pulling down at Hal’s "Lot-A-Fun." Shrewd tactic, for this was where the serious Stardust would gather on her. Crazy publicity stunts were the order of the day in the twenties, and Bebe pulled off a doozy when she got herself arrested for speeding (72 MPH in a 50 zone) and was sentenced to ten days in a podunk jail within hailing distance of Hollywood and its non-stop press brigade. No sooner was she ensconced in the hoosegow than a procession of celeb friends arrived to relieve her anguish. A Persian rug and ivory bedroom set adorned her cell, and the guestbook she maintained during the incarceration eventually netted 792 signatures (bet that would be quite a collector’s item today!). Abe Lyman and His Orchestra serenaded her from outside the barred window. The whole silly business culminated with Bebe’s next vehicle following her release, The Speed Girl. That one’s lost, as are virtually all of her Paramount features. These images and trade ads can only suggest what all those pictures might have been like. At least one of them, Senorita, does survive, but good luck seeing it, as it’s only been unspooled at one US silent movie gathering I’m aware of. As you can see, Bebe plays a kind of female Zorro in it. She was quite the athlete on screen, forever running, swimming, riding --- in a seemingly endless series of college comedies, romantic farces, costume capers --- whatever sold. She was also going in at night and helping edit the movies, plus writing, then producing. Eventually, she had her own unit at Paramount, and near complete autonomy to do the pictures as she saw fit. Bebe had a way of lucking into headlines that earned her the (benign) nickname of "The Good Little Bad Girl." On one occasion, her jewelry was stolen during a stopover in Chicago. Mob capo Al Capone got wind of it and sent out the word that Bebe’s baubles had better be returned --- or else. Legend has it that Big Al himself delivered the ice next day. Talk about landing in a field of clover! Was it any wonder that Bebe was the hottest Mama in movies? Talkies dealt a cruel blow when Paramount inexplicably refused to give Bebe a voice test. 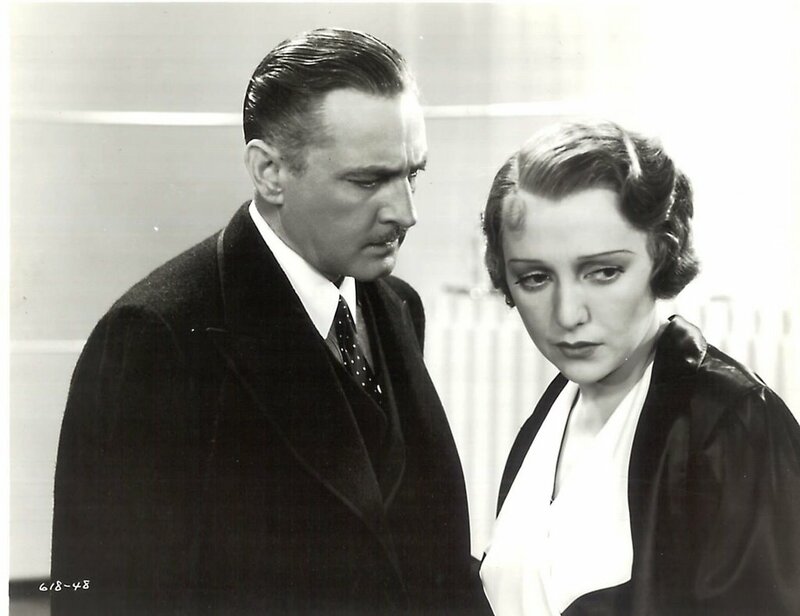 Part of that was anxiety over sound prospects for silent stars, and the studio’s belief that stage players would naturally supplant former idols, with the happy outcome of paying unknown legit players far less than established names like Bebe Daniels were getting. Efforts to get before a microphone were rebuffed, so Bebe bought out her remaining contract, then headed for RKO, where she scored a triumph as the singing lead in Rio Rita, a smash hit (hey, it out-grossed King Kong!) which led to a brace of musicals culminating with the one she’s best remembered for, 42nd Street (1932). 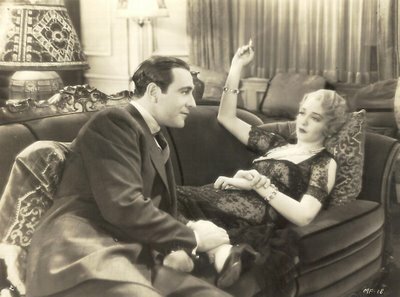 Bebe was a stirring presence in a number of pre-code favorites --- some of them illustrated here --- The Maltese Falcon with Ricardo Cortez, Reaching For The Moon opposite Doug Fairbanks, Sr., and as romantic vis-à-vis to John Barrymore in a great one, Counselor-At-Law. Despite good work in these, her leading status had diminished, and the move to England in 1935 seemed a good opportunity to regroup. That it would lead to an entirely new, and fantastically successful second career, could not have been anticipated. Any performer who would broadcast through a London air raid was some kind of alright as far as the British public was concerned, and it was this sort of courage under fire that made Bebe and husband Ben Lyon (married since 1930) national institutions around the U.K. 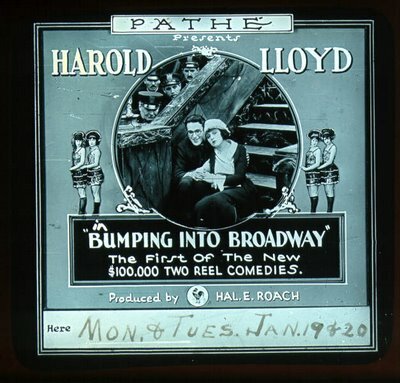 They started in music halls, where man-and-wife variety acts enjoyed great popularity during the late thirties, but it was radio that really put them over. The real-life bickering (but ultimately devoted) show-biz couple formula was still fairly fresh at that time, and Hi, Gang! was a wartime ritual for listeners throughout the isles. 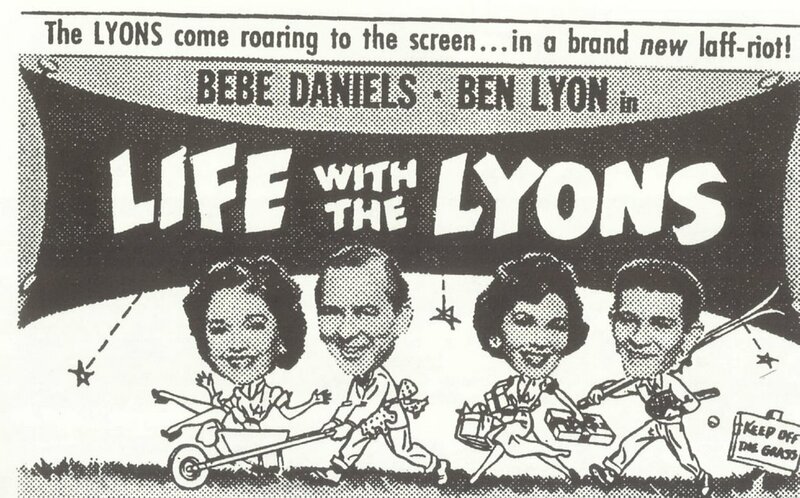 The Lyons would even take a leaf from Ozzie and Harriet Nelson’s book when they converted the series into a family sitcom shortly after the war. 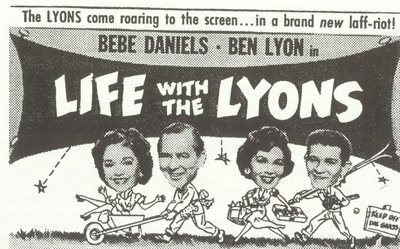 Real-life son and daughter Barbara and Richard teamed with their parents for Life With The Lyons, and there would be two features (produced by Hammer Films!) and a television series spun off from there (here they are on the set). 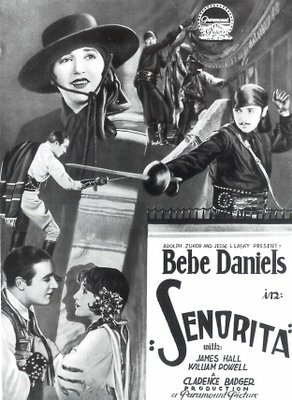 This was the first program of its kind in England, and Bebe Daniels co-wrote all the episodes. She maintained a vault of jokes and comic situations accumulated over her forty plus years in the business. Harry Truman awarded Bebe the Medal Of Freedom for wartime work on behalf of our allies. She was the first woman to come ashore at Normandy after the invasion. It’s really a shame Bebe Daniels isn’t better known today. Her death in 1971 came just short of what might have been a major rediscovery by writers and historians, and a book-length investigation of her life and accomplishments is certainly a thing now long overdue. 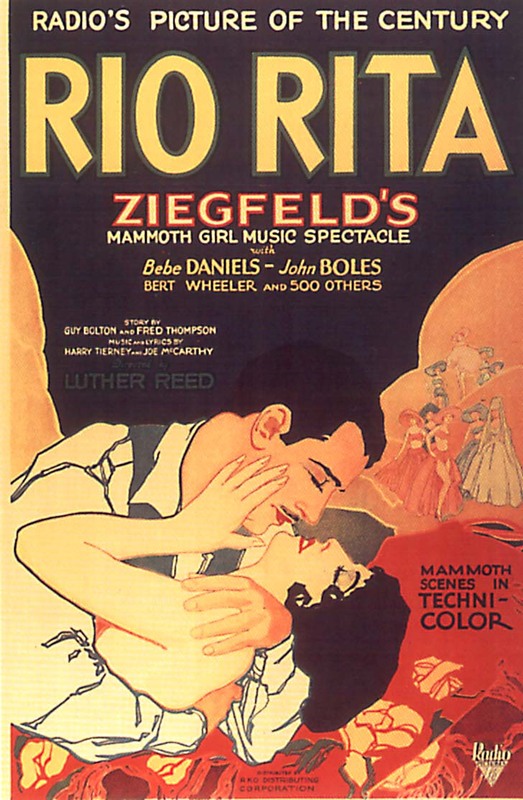 Our thanks to poster dealer and collector Bruce Hershenson for his kind permission to use the very attractive one-sheet image of Bebe Daniels in Rio Rita, which we found in Bruce’s excellent compilation, Musical Movie Posters (you can order that HERE). Nice choice! You're absolutely right; Bebe definitely needs a bio of her own. Hopefully some university press scribe will see your post and get inspired! As for getting her work into circulation... I'd certainly love to see more of her pre-code pictures! I'll have to get a posting on her This is Your Life episode up on my blog later this week. Thanks (yet again) for the inspiration! Thank you so much for the info on Bebe. I have to agree she was a powerhouse that unfortunately is largely forgotten about today, and yet she broke so many boundaries for women in film and tv. Hopefully someone one day will write the biography that she deserves. Hey John, great piece on Bebe!! Interesting that you would mention that she had a lead foot. I had a letter from the early 30's that she hand written on her personal stationary to a fan in which she included as one of her favorite pastimes, "driving her roadster VERY fast!" this was at a time when cars had no power steering or power brakes as well as standard transmitions and were mostly driven by men. I assure you, she must have been one tough gal! Wish I could have met her. I'm afraid to say Bebe is just as forgotten in the UK today as in the US. 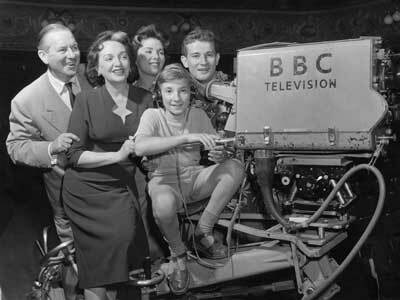 An episode of Life with the Lyons was shown on the BBC last year, but was completely spoilt by cutting to studio-based commentators throughout! The National Film Theatre did have a season of surviving 1920s starring features a few years back, including Senorita - but useless mug that I am, I missed every one. Massive thanks for another wonderful article! It's so sad (understatement) that many of Bebe's films are lost... wish more studios cared about film preservation.